What is a Hamptons house? The Hamptons has always been a place at the forefront for emerging design trends. From simple farmhouses to grand summer homes and modernist mid-twentieth century design. Most popular of these styles and the style most associated with Hamptons architecture is the American craftsman home, characterized by their large intricate roofs, colonial glazing and balanced mix of timber and stone cladding. 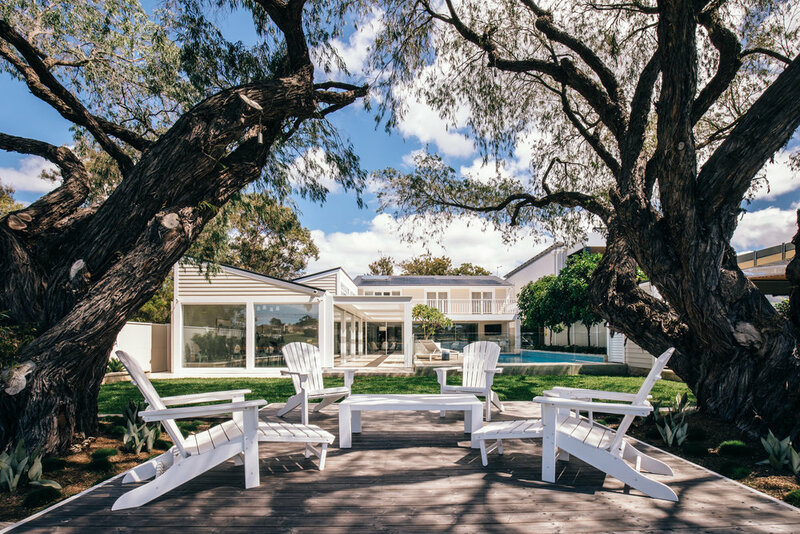 The craftsman has a had a modernist influence over the years, Inspired by the exquisite beauty of the natural environment of long Islands, East End. The Hamptons home has evolved for modern living embracing the outdoors, natural light and the demand for open plan living. Hamptons Style is coastal and casual while still being sophisticated and elegant. In Long Island they enjoy 3 months of summer,so holidays homes are styled in this way to embrace the summer months and coastal living. This has become increasingly popular in Australia over the last decade, since we enjoy coastal weather all year around in some parts of the country. Designing and decorating homes this way is well suited to the Australian relaxed lifestyle. Can we do a Hamptons Renovation? Every home has the potential to achieve that amazing Hamptons look and feel. It may not seem obvious or even possible to you but with the right choice of materials and finishes, a cleaver and well thought out design and the right team your property can be transformed to your dream home. When we first arrived at our Sylvania Waters 02 project the home was your run of the mill cement rendered 80’s modernist home that had seen its far share of renovations over the years. 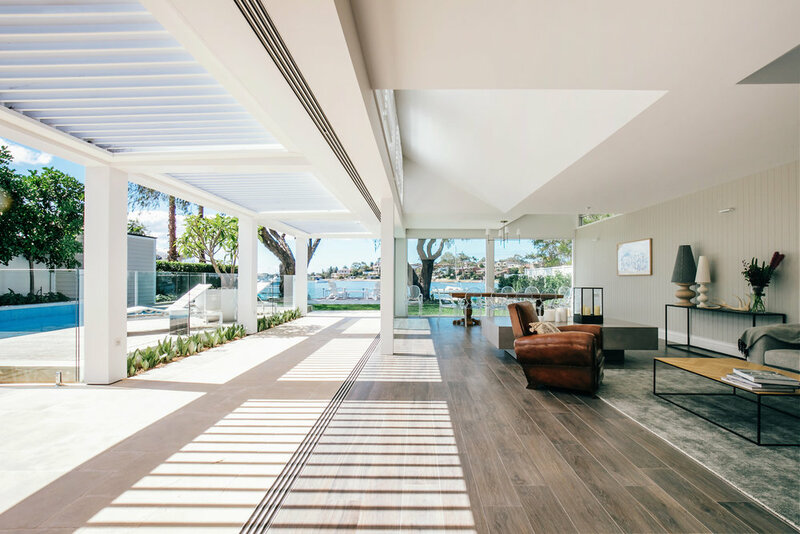 The front of the house was dominated by a large sloped roof and 2 boxy structures that stood proud at the front of the property courtesy of an earlier renovation. The entrance was lost between the 2 structures with no sense of precedence, your . Our solution was to create a large gable entrance that would dominate the facade and draw your eyes away from the triple fronted garage and toward the beautifully crafted entrance. 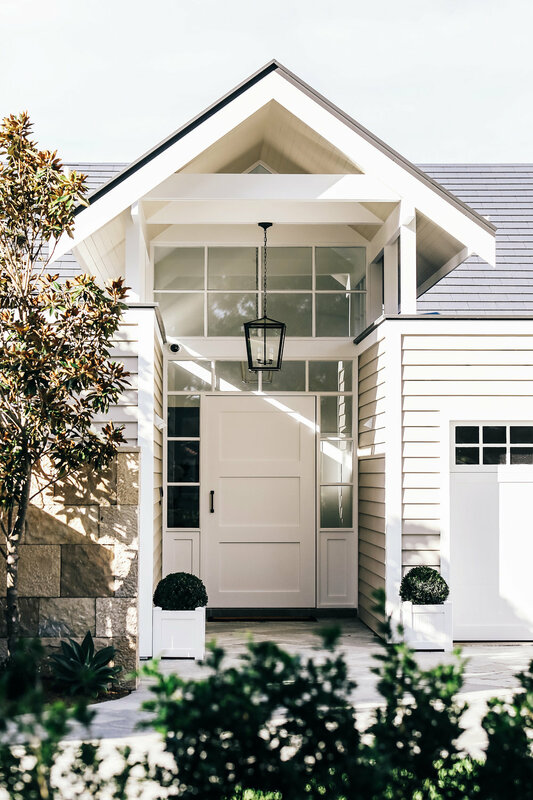 The entry features Scyon Linea weatherboard cladding with a custom designed pivot entry door, a chandelier hangs in the entry void drawing your eyes upwards to the exposed roof structure clad HardieGroove lining. The garage was also clad in Scyon weatherboard and bespoke garage doors were installed in place of the existing panel lift doors. At the back of the house a colorbond clad addition with a saw tooth roof extended outward from the existing home. The house was finished in a mustard coloured cement render with natural aluminium glazing, 2 louvered pergolas provided some shelter to the outdoor areas however insufficient for a year round alfresco area. The house was then clad at the rear in Scyon weatherboard, little changes were made to the building envelope aside from a large balcony extension to the first floor which would provide a more suitable shelter for the new BBQ and alfresco area. A custom timber balustrade was built in lieu of the original contemporary glass balustrade. All the Aluminium glazing was replaced with white anodized glazing, floor to ceiling Vitrocsa glazing system was installed on the ground floor to create seamless interaction between the inside and out as well as allowing for panoramic views. A custom louvered awning was installed adjacent the living space to provide sun control to large room, the adjustable louvered awning also provides shelter to allow for more outdoor entertaining space. The primary focus internally was to create a more open plan living space that would allow for entertaining, seamless interaction with the outdoor spaces and perhaps most importantly took in the natural beauty of the site. The result was achieved by designing a new structural post and beam system that would allow us to remove the majority of the ground floor walls, post were hidden where ever possible and as far apart as feasible. The bespoke Vitrocsa sliding door systems runs external to the posts allowing the doors to move freely around the footprint of the building, this was critical to allow us to create spaces where the doors could be hidden from site. To avoid having siding door panels blocking views and obstructing the flow between the internal and external spaces we used Vitrocsa turnable door system which allowed us to create a parking bay for the large sliding doors. At the entrance to the property the driveway was rebuilt with a natural stone. A custom gate and entry arbor was built to compliment the house and provide privacy and security. If you are thinking of renovating or rebuilding please send us an email with details of your project and we will get in touch with you as soon as possible.